'California blue' was written by Roy Orbison, Jeff Lynne and Tom Petty. 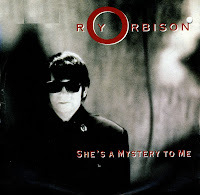 The latter two worked with Orbison on what was to become his last album, 'Mystery girl'. The album was released briefly after he died in December 1988, since the lead single 'You got it' had already become a hit while he was still alive. The song was released as the third single from the album in the spring of 1989. It wasn't a hit, stalling at number 77 in the UK singles chart and sinking without a trace in most European countries. The song was released as the second single from his last album 'Mystery girl', completed just before his death. 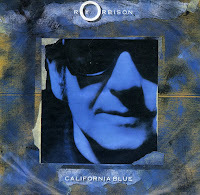 It was another hit for Orbison, peaking at number 27 in the UK singles chart and number 18 in the Dutch Top 40. 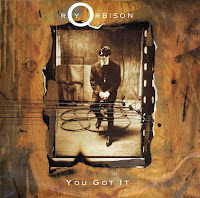 When Roy Orbison made his comeback with this single, 'You got it' in December 1988, it was a remarkable return. Although he released a few new tracks throughout the Seventies and Eighties, his last big hit was 'Penny Arcade' (1969), which reached number 1 in Australia. He was involved in the Traveling Wilburys' 1988 single 'Handle with care', but this single from 1989 meant that he was riding a whole new wave of success. 'You got it' was taken from his comeback album 'Mystery girl' (1989). That album was completed shortly before his death of a heart attach on December 6, 1988. Orbison gave his only public rendition of the hit, to the applause of a huge crowd, at the Diamond Awards Festival in Antwerp (Belgium), a few days before his death. The single reached number 1 in Canada, number 9 in the US Billboard Hot 100 chart and number 3 in the UK singles chart and the Dutch Top 40.